p>Parks And Recreation star Amy Poehler has hit out at the National Rifle Association after the gun lobby group used an image of her on Twitter. The NRA posted a gif of Poehler’s Parks And Rec character Leslie Knope in a tweet thanking US radio host Dana Loesch for supporting the group after the Florida school shooting. Though not on Twitter herself, Poehler told the NRA to “f*** off” in a message passed to Parks And Rec creator Michael Schur, who tweets as Ken Tremendous. He wrote: “Hi, please take this down. 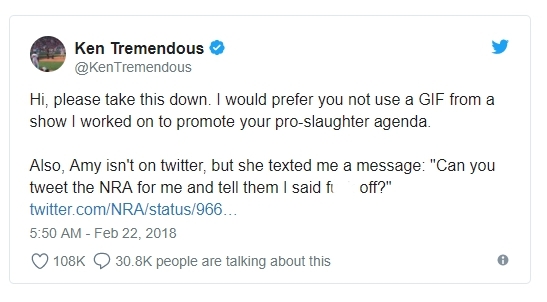 I would prefer you not use a GIF from a show I worked on to promote your pro-slaughter agenda.